1) Preheat the oven to 400°F. Lightly grease a standard 12-well muffin pan. Or line the pan with paper muffin cups, and grease the cups. 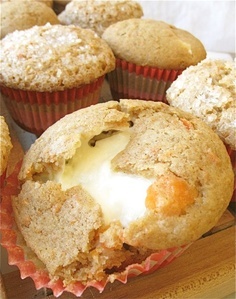 2) To make the filling: Place the cream cheese in a microwave-safe bowl, and heat on low power for 40 seconds. Stir in the sugar and flavor. Set aside. 3) To make the muffin batter: In a medium-sized bowl, whisk together the dry ingredients. 4) In a small bowl, whisk together the eggs, water, and oil. 5) Stir the wet ingredients into the dry ingredients. 6) Fold in the grated carrots, stirring to combine. 7) Drop about 2 tablespoons of the batter (a tablespoon cookie scoop works well here) into each muffin cup, spreading it to cover the bottom. 8) Dollop on a heaping tablespoon of filling; a level tablespoon cookie scoop works well here. 9) Cover with enough batter to fill the muffin cups quite full. The batter will come to within about 1/4" to 3/8" of the top of each muffin cup. But don't try to use all the batter; unless you have particularly deep cups, you'll have abut 1/3 cup batter left over. Bake it in a separate custard cup, if desired. 10) Bake the muffins until a toothpick inserted into the cake part of one (not into the cream cheese filling) comes out clean, about 20 minutes. The tops of the muffins will feel firm to the touch. 11) Remove the muffins from the oven, and as soon as you're able to handle them, transfer them to a rack. If you serve the muffins warm, the filling will be molten. If you wait for them to cool, it'll firm up.